Usually, when people compliment your skin, their next question is, “What do you use?” I figured this was a good launch point because it gives me a chance to discuss my product preferences (and biases) upfront. It’s not that I haven’t liked other products, but Deciem brands hold a place of honor in my skincare routine. In early 2016, I was reading some posts on the MakeupAlley Skincare board, and someone referenced an article by Caroline Hirons on a brand called NIOD (my own subscription to her blog was not working well at the time, and I missed the post when it was originally published). As much as I was fascinated by the products described in that post, the most significant thing I noticed was that Brandon Truaxe, the founder of Deciem, was heavily involved in the comments section, answering questions. And not just quick one sentence replies–full explanations. To this day, I have never seen a brand owner interact on social media to the extent that Brandon did on that post. I read EVERY SINGLE COMMENT on that post, and then turned around and placed my first order. My skin already looked pretty good when I received my first NIOD products, but now my skin actually feels good, too. A year and a half after my first order, most of my skincare is from Deciem (and I’m phasing out most of the non-Deciem stragglers). I primarily use the NIOD line, but add in a couple of products from Hylamide and The Ordinary to address specific concerns. This doesn’t even include the amazing lotions and such from The Chemistry Brand. I’d be happy to discuss my specific routine in more detail if there’s interest, but I don’t want to bog down this post with that much other stuff. The bottom line is that I really like Deciem’s skincare. It’s worked well for me, and I’ve found their customer service to be excellent. I have no affiliations with them; I have no financial motivation in praising their products, but I probably do have a bias because of the results I’ve seen on my own skin. 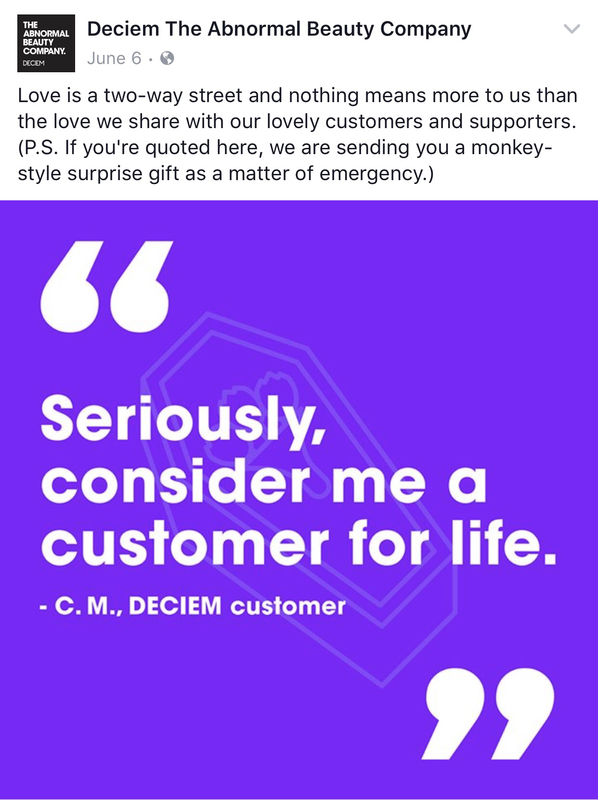 I’m going to end with a post that Deciem did a couple of months ago as part of an ad campaign. The campaign was a series of quotes from actual customers, and the quote below is mine (it came from a discussion with Customer Service).